Naturally one would assume that E. T. Investigations was formed to look into encounters with UFOs and aliens from beyond this world. In fact, Emily Trace opened this detective agency to find out why her husband had been murdered. To fund her personal investigation she takes on a client who, like us, mistakes the significance of the initials “E. T.” Assigned to look into the apparent disappearance of the region’s meadowlarks, Emily and her friends are drawn into a bigger mystery, one that does involve aliens and other worlds. This book is very hard to place into a specific genre. It is a mystery, a science-fiction novel, perhaps a police procedural, and may even qualify as a “cozy.” Regardless of where it fits, it is a most entertaining and enjoyable read. Set in and around Spokane, Washington, and told as if by Emily herself, the pages turn at a rapid rate. Uniquely, Emily sometimes stops to admonish the reader or to remind them of bits of popular culture from days gone by, which adds to the direct conversational tone of the story. 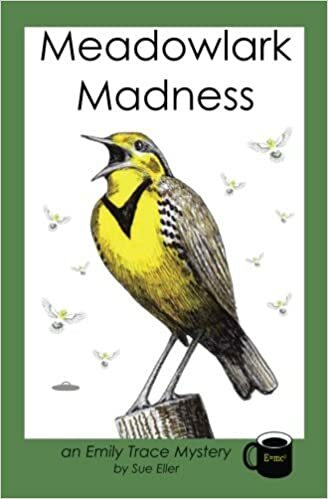 Meadowlark Madness is a very enjoyable book, created by a writer with a clever and unusual view of the world. This reviewer looks forward to reading more of the Emily Trace Mysteries as they become available. Emily Trace’s husband, Jared, has been murdered, and the police can’t figure out who did it, so Emily opens up her own detective agency to solve the crime herself. However, business is slow–no customers. Without customers she has no money to pay her bills and rent, and soon she’ll be forced to close her office and move out. If only she had one paying client… Then the office door opens and in walks a birdlike little character named Mr. Archibald Wren. He has a case for her to solve. A very strange case, for you see, he wants her to solve the mystery as to where all the world’s meadowlark birds have disappeared to. And thus, the strange, sometimes out-of-this-world adventure begins. Meadowlark Madness is Eller’s first Emily Trace Mystery. It’s well-written and her characters are well-defined, clever, and interesting. The story is fast-paced and exciting. I thoroughly enjoyed reading this book, and I recommend it to all who love a good mystery. Ms. Eller has woven an interesting tale, full of quirky characters and surprising twists and turns. Her ability to break the forth wall at regular intervals gives us the feeling that Emily is sitting with us as she tells her story. She keeps it moving right along so that you don’t even want to stop to get a fresh cup of coffee. But, you must, because she has subliminally made you need one. I have heard that there is a second book in the works and I will be first in line to get it. I must know if Emily will find Jared’s killer. In the meantime, I must put on a fresh pot of coffee and wait. Meadowlark Madness, by Sue Eller is a delightful book that is filled with mystery, mystique, and wonderful characters! The heart and soul of the story is Emily Trace, a widow who takes over her deceased husband’s detective agency. When she renames the business: E. T. Investigations, not only does business begin to pick up, so does Emily’s adventures! Sue Eller has created a cast of memorable characters, a plot filled with twists and turns, and she has even managed to add a touch of whimsy in a story filled with down to earth, relatable people! I enjoyed Meadowlark Madness very much! I quickly got caught up in the story, and I look forward to reading the next Emily Trace Detective novel. Sue Eller is a talented writer with a marvelous imagination! I totally recommend this book, it was a great read! Meadowlark Madness: This is a wonderfully written mystery, slash science-fiction novel. Emily Trace is smart, witty, and sarcastic, she is everything you look for in a female PI. Just when it seems her dreams of running her own Pi business looks to end, an out of this world job lands in her lap. I found not only the story intriguing, but also hilarious, and in some areas heartfelt with each turn of the page. I think that Sue Eller did a wonderful job bringing each character to life and giving them personalities that stick with the reader along with a strong story. If you like mysteries with a dash of science-fiction and a sprinkle of comedy, read this book.